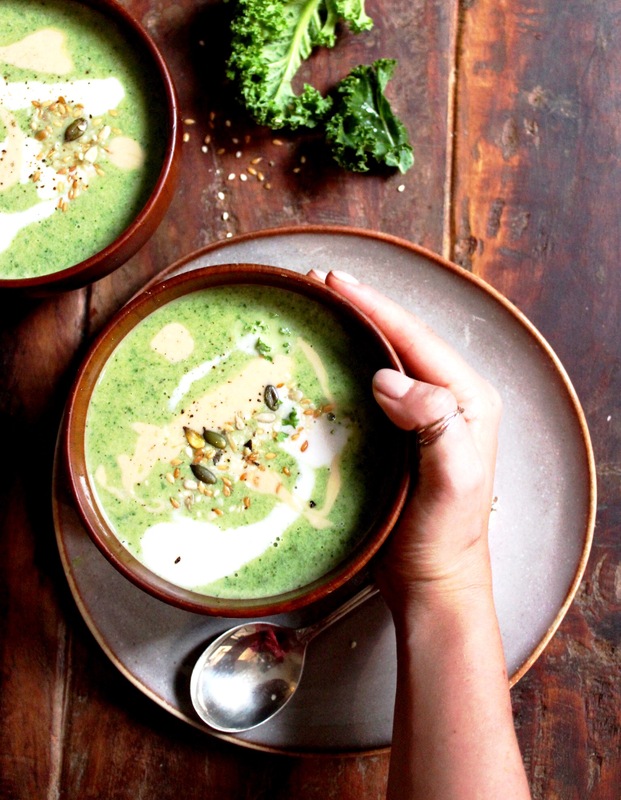 Sometimes you just need a bowl of green goodness to get you glowing from the inside out. This soup is amazing, in every sense. It’s incredibly nutritious, bursting with vitamins, fibre, iron, magnesium and antioxidants and it tastes sensational. It’s also remarkably easy to make. Add even more flavour and a little crunch by sprinkling on some toasted nuts and seeds and a drizzle of runny tahini! Dice the onion and mince the garlic. Add a tablespoon of coconut oil to a large pot on medium heat and add in the garlic and onion. Sprinkle in the cumin and a good pinch of coarse salt and stir well. Pop the lid on and let the onions soften for about 3 minutes. Chop the broccoli into florets and remove the stalks from the kale. Add the broccoli, spinach and kale to the pot and toss everything. Pour in the stock and stir. Adjust the heat to allow it to come to a simmer and then pop the lid on. Leave it to simmer for about 10-15 minutes, until the broccoli is tender. Don’t worry if the stock doesn’t cover all of the veg. When the broccoli is tender, transfer the contents of the pot to your blender (you may need to do this in batches) and blend until smooth. Return the soup to the pot, on low-medium heat and stir in the coconut milk. Toast your nuts and seeds in a pan on medium heat until crisp. When the soup is heated through, serve with a drizzle of tahini and the toasted nuts. I like to add another drizzle of cool coconut milk, too. Hi, Did you use tinned coconut milk for this recipe? Made this soup today, it is absolutely delicious! Great recipe that I will definitely be using again! That is one beautiful bowl of soup! I shall be making this for sure! I love how simple ingredients can look so fancy. Made it,very easy. Crazy crazy delicious. Hi there – I was wondering if the little green goddess soup would freeze well? Wow, this is like a warm hug in a bowl! Made some yesterday and just had the leftovers for lunch, tastes just as good heated up the next day. This is my second time to make this soup .Immot the biggest fan for eating green veg ..but since making this I am loving the greens .Thanks for such a great green receipt and converting me …yummylicious???? Hi, is 450g broccoli correct? Seems an awful lot. 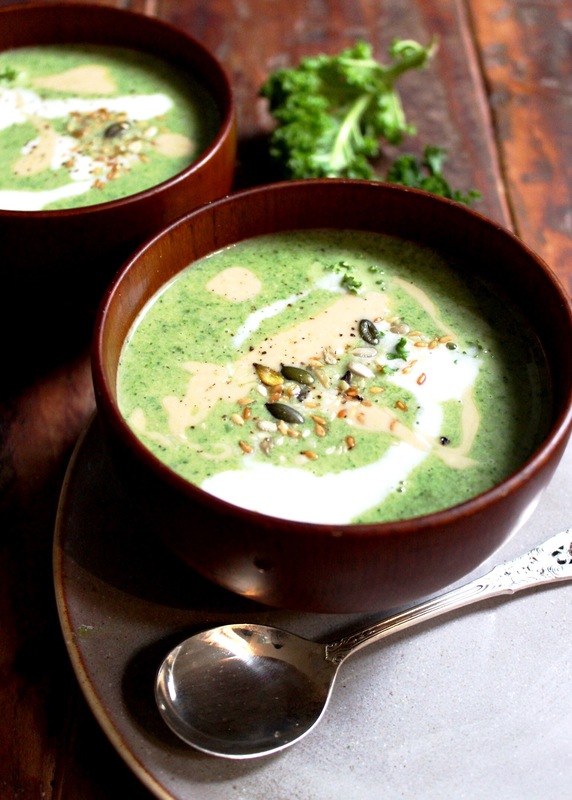 I made the soup with 200g broccoli…was delicious and the added tahini really lifted the flavours…. I’m trying you chocolate hazelnut butter next! This soup is delish! Making it has become a Sunday ritual for the week ahead! Its comfort food with out the feeling of guilt! I added a courgette to it also as I didn’t have enough broccoli and it worked a treat! People in my office where very intrigued and jealous ????! Only 45g of kale and spinach? Why so little? This soup looks lovely, however, I am suffering from a severe case of Candida, I’ve never done a yeast free diet before, so my question is what is the alternative to stock in this soup? This was amazing! The only thing I added was a chopped leek. I had an abundance of kale, broccoli, and spinach from my CSA and was looking for something I could make and freeze. This is a keeper. Thank you!! Do you use tinned coconut milk?